I never go anywhere without my lip balm and I’ve been a huge fan of the Carmex original formula for years so I’ve really been enjoying the new flavors and tints that they’ve been coming out with. Apparently I’m not the only one who loves this stuff because they’ve been making the original formula since 1937, which makes me wonder why it took over 70 years to come out with the new cherry flavor, but it’s pretty awesome too. In addition to the original jar, you can get Carmex lip balm in a tube or a stick formula in your choice of cherry, strawberry or original flavors. My daughters are really partial to the new Moisture Plus sticks because of the colors they come in, so unfortunately I’ve never been able to hold on to the sticks, they keep disappearing on me. My absolute favorite thing though is their new line of healing lotions. I have Keratosis Pilaris (a.k.a. KP – it causes rough, dry skin and 1 out of every 2 people have it) so I use lotions with Salicylic Acid or Glycolic Acid in them to smooth my skin, but they can be very expensive. The new Carmex Healing Lotion and Healing Cream have Salicylic Acid in them, as well as other healing ingredients like Lanolin, Vitamin E and Aloe and they’re reasonably priced at around $5 each. The lotion is perfect for everyday use and the cream is wonderful for the roughest, driest spots like heels and elbows. At first I was surprised that the lotions smell just like the lip balm, but it’s a nice light pleasant scent. I’ve used the lotions for a little over a month now and I have to say that they’re definitely the best I’ve tried for the price. They work very well on both my dry skin areas and normal skin areas without being greasy like some other healing ointments and creams. I’ve been such a big fan of Carmex for so long that I was thrilled when I was invited to be a part of their blogger outreach program and it felt like Christmas when I got the package containing their whole product line in this neat travel bag, but I’m even more excited that they’ve offered an identical Carmex skin care kit to one of my readers. 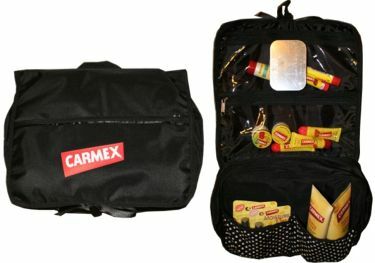 One lucky reader is going to win a Carmex Skin Care kit including one Carmex Healing Lotion, one Carmex Healing Cream, three Carmex Moisture Plus sticks, and one each of the tube, stick and jar lip balms in a handy travel bag. Leave a comment with your favorite Carmex product, or one you’d like to try. This entry is mandatory but you may also do any or all of the following for additional entries. Leave a comment on this post for each entry so that all of your entries count. The winner will be chosen at random at midnight CST on Friday November 5th. Tweet about this giveaway and include me @sdenise so that I can see it (you can do this up to once daily). Like Carmex on Facebook, or just say if you already do. Disclaimer: Carmex provided me with their line of products in the travel bag pictured and graciously offered an identical set to giveaway to one of my readers. The thoughts and comments provided are my own and I received no compensation for this post. I love the healing cream! I like you on facebook and subscribe via e mail.